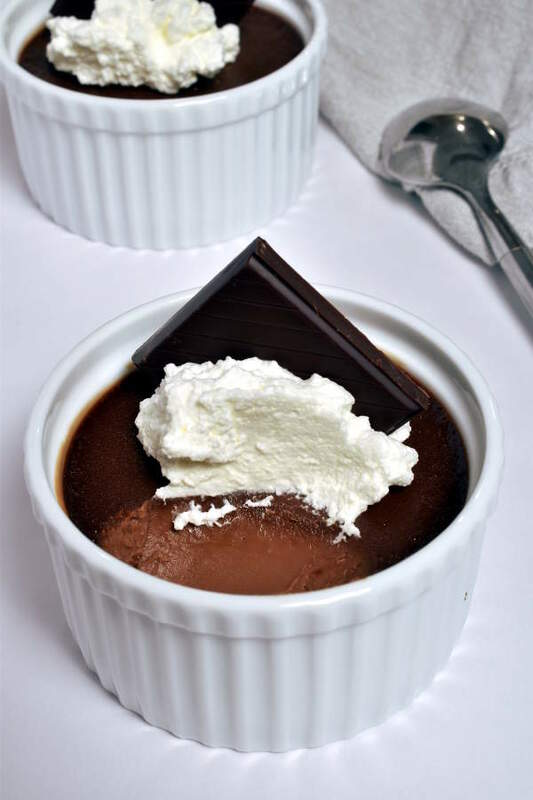 Dark Chocolate Pots de Crème are thick, luscious French custards, dominated by chocolate. Like many European deserts, these pots de crème are not overly sweet, so you really taste the intense dark chocolate flavor, not just sugar. It’s no secret I love chocolate. Exhibit A, these Chocolate Covered Strawberries. When we’d been dating for about a year, Jonathan said he’d eaten more chocolate in the past year than in his entire life before he met me. Chocolate is a daily thing for me. 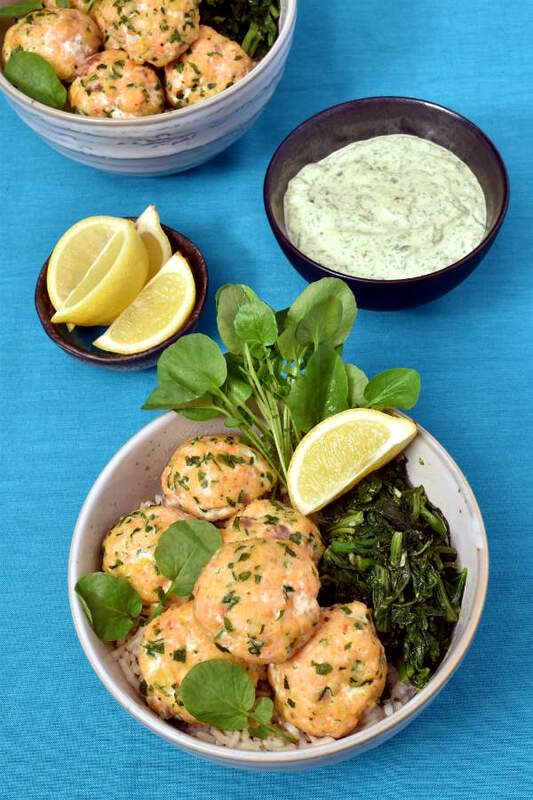 I hinted at this recipe a while back on my Facebook page, and I’m very happy to be sharing it today. A pot de crème is a French custard. It is generally flavored with either vanilla or chocolate. 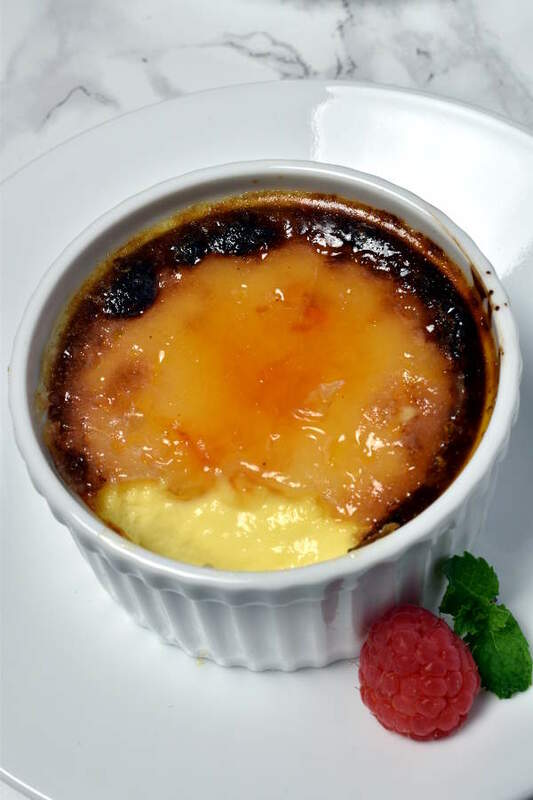 If you look at my recipe for Crème Brulée Without a Blowtorch, it is basically a vanilla pot de crème with a crispy burnt sugar topping added. 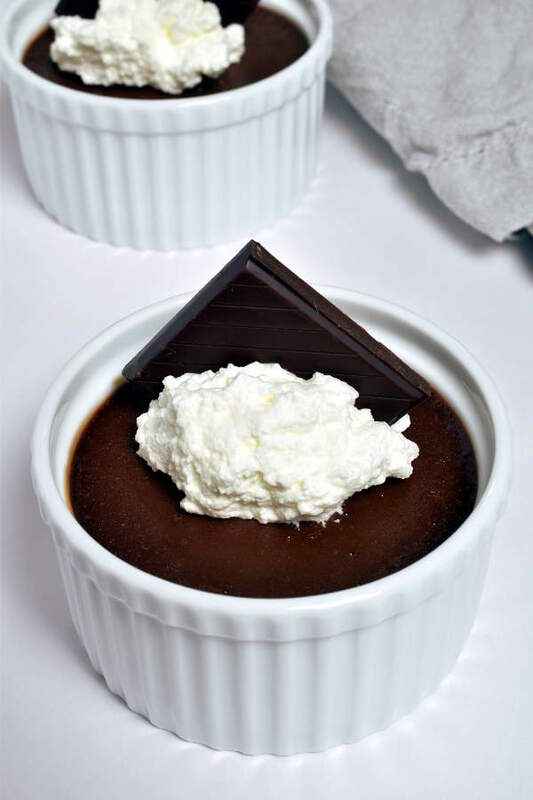 If you’d like to make a chocolate crème brulée, simply make this recipe for chocolate pots de crème and then follow the steps in the crème brulée recipe to add the burnt sugar topping. 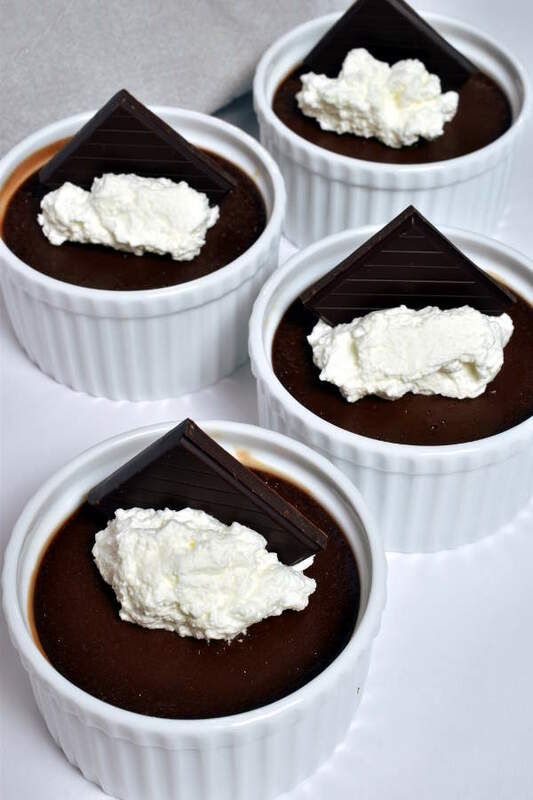 These dark chocolate pots de crème are the perfect make-ahead recipe for a dinner party or company. After baking, you chill the custards in the fridge to let them thicken and top with whipped cream right before serving. 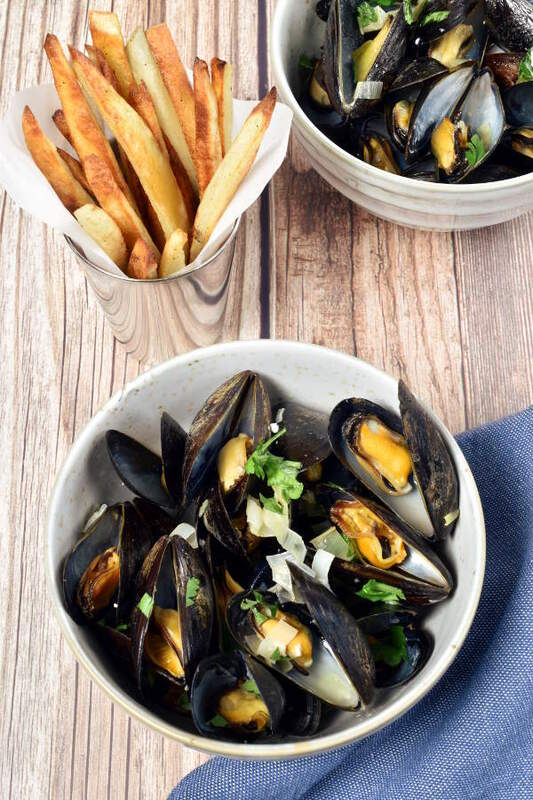 You can even make them a couple days before and just keep refrigerated until ready to serve. Here are the ingredients. There’s chopped dark chocolate, egg yolks, sugar, heavy cream, vanilla extract, and instant coffee. While I’ll eat any type of chocolate, I do like dark chocolate in particular. I’ve been known to eat unsweetened baking chocolate right out of the wrapper. 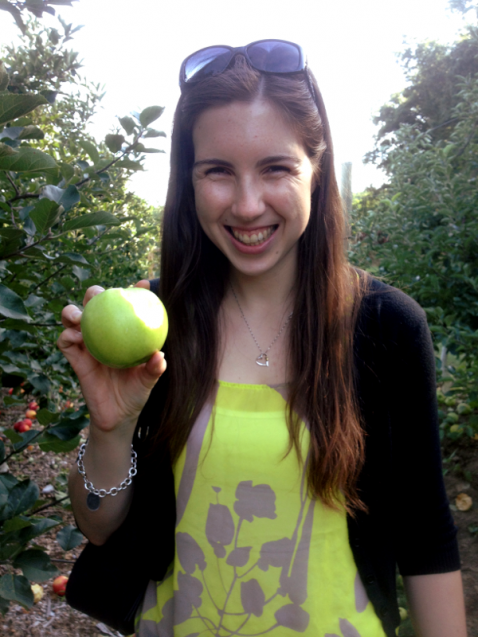 I’m talking about chocolate with literally zero sugar or artificial sweeteners. I mean, chocolate by itself, without sugar, is a healthy fat, right? But I do prefer chocolate slightly sweetened. Currently I’m really into eating the Ghirardelli individually wrapped 86% chocolate squares as a snack on my bus ride home from work. I used Lindt 70% dark chocolate for this recipe because I think 70% cacao is the most common type of dark chocolate sold. While this custard is very thick and rich and luscious, it is not very sweet. If you like sweeter desserts, you may want to use semisweet chocolate or add an extra tablespoon of sugar. Adding a little bit of coffee to chocolate desserts really helps bring out the chocolate flavor. I don’t like to have caffeine at night, so I bought a container of decaf instant coffee granules to use in baking and desserts. You can leave the coffee out altogether if you prefer, but I do think it adds to the flavor of the custard to include it. First I whisked together the egg yolks, sugar, vanilla, and salt. I brought the cream and coffee granules to a simmer. Then I removed it from the stove and whisked in the chocolate. After that, I mixed the chocolate mixture in with the egg yolk mixture a little bit at a time. Then it’s important to pour the entire mixture through a fine mesh strainer to make a smooth custard. Bake the custards in a water bath for about a half hour. They’ll need to chill for at least 2 hours before serving. Light and airy whipped cream is a nice contrast to the thick and dense custard. I loved getting a little bit of whipped cream on the spoon with each bite of the dark chocolate pot de crème. 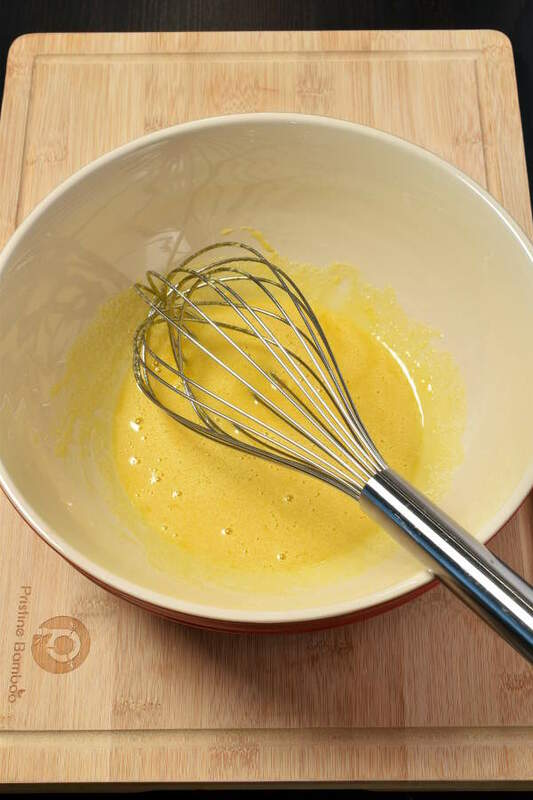 In a large mixing bowl, whisk egg yolks, sugar, vanilla, and salt together until thoroughly combined. Add cream and coffee granules to a saucepan and bring to a simmer over medium heat. Once simmering, remove from heat. 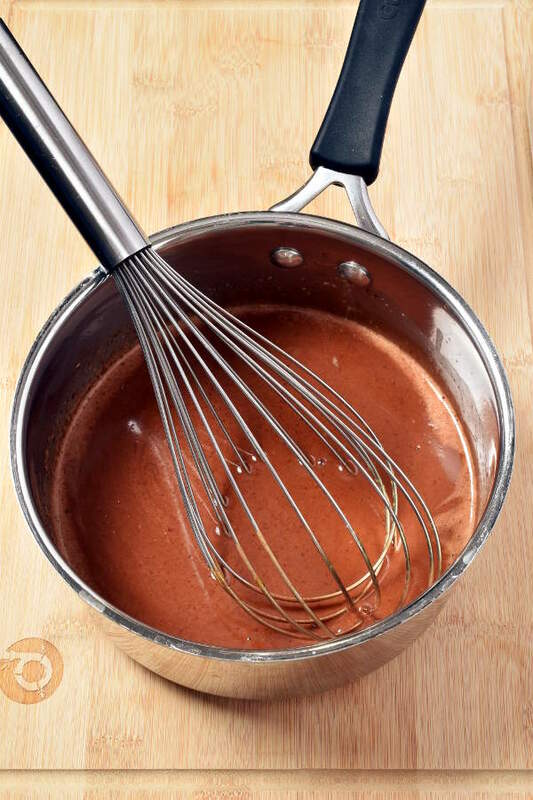 Add chocolate and whisk until chocolate is melted and the mixture is smooth. 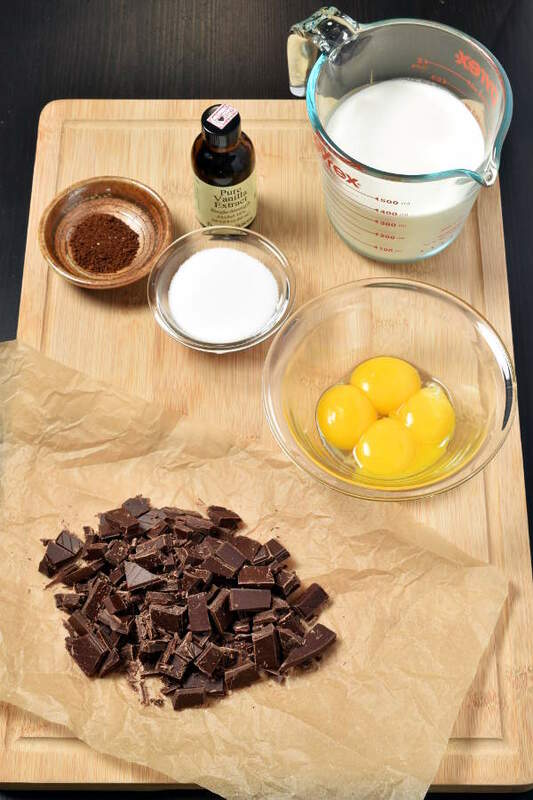 Add a little bit of the chocolate mixture at a time to the bowl with the egg yolks. 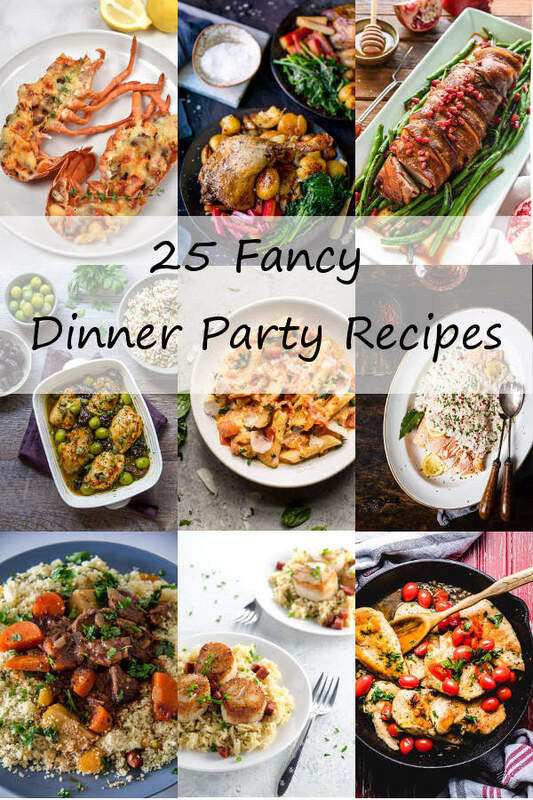 Whisk to combine thoroughly after each addition. When all the chocolate mix has been incorporated, pour the entire mixture through a fine mesh strainer into a large measuring cup or pitcher, or a second mixing bowl. Place 4 (6 ounce) ramekins on a roasting pan. Pour or ladle mixture into ramekins. Pour boiling water from teakettle into the roasting pan until it reaches about ½ inch high. Be careful not to let water get in the custard. Bake 30 to 35 minutes, until the custards are just set. The center should not be liquid but should be very jiggly. Let cool 10 minutes, then carefully remove ramekins from roasting pan. Transfer to fridge and chill at least 2 hours. Top with whipped cream right before serving. This pot de crème is not very sweet. If you prefer sweeter desserts, use semisweet chocolate or add 1 extra tablespoon sugar. If you’d like a chocolate crème brulée, follow the steps in this recipe to add the burnt sugar topping. 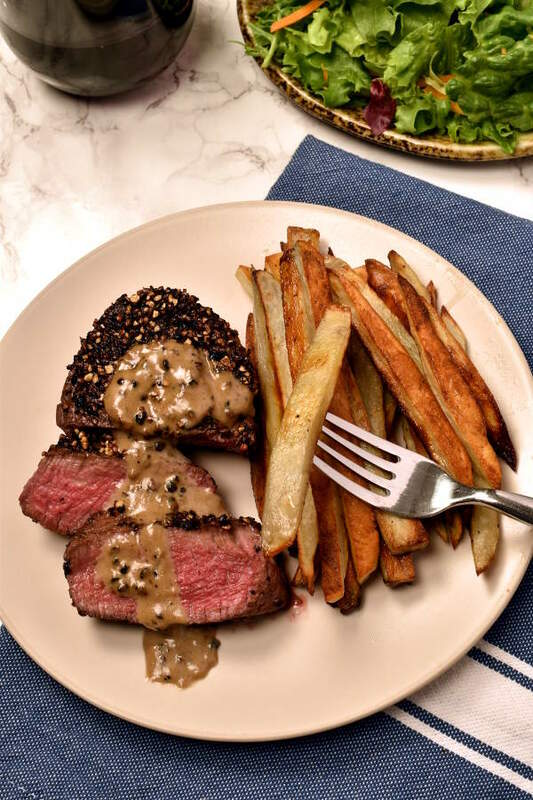 You don’t need a blowtorch. Calorie information includes 2 tablespoons whipped cream topping per serving.